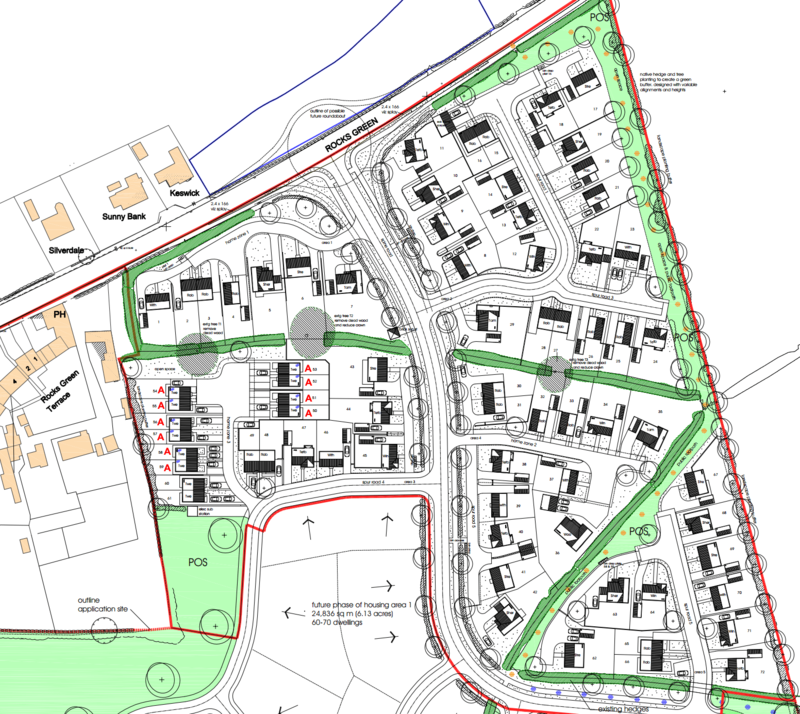 Pickstock Homes has changed the site plan to deliver 10 affordable homes (14%) in the first phase of 72 homes (17/05189/FUL). It argues that to provide 11 homes, the 15% agreed by the South Planning Committee, “would require alterations to the considered layout in respect of changing semi-detached units and altering the dwelling arrangement.” I think what it means is that it doesn’t want to create a semi-detached house with one half being affordable and one being full market. Shropshire Council’s planners have agreed to press Pickstock for the full 15% of affordable homes. The developer has also indicated that the full site could take at least a decade to build. The first phase will begin this year and take two to three years to build. An application for the second phase will be made by 2022 and the final phase of the 200-home development by 2026. This means it could be 2030 before the housing is completed, a build-out rate of 17 homes a year. Pickstock says it needs this much time to have the flexibility to “respond to the undetermined market conditions of Ludlow.” That’s code for saying it is not sure that it can sell the homes any quicker. 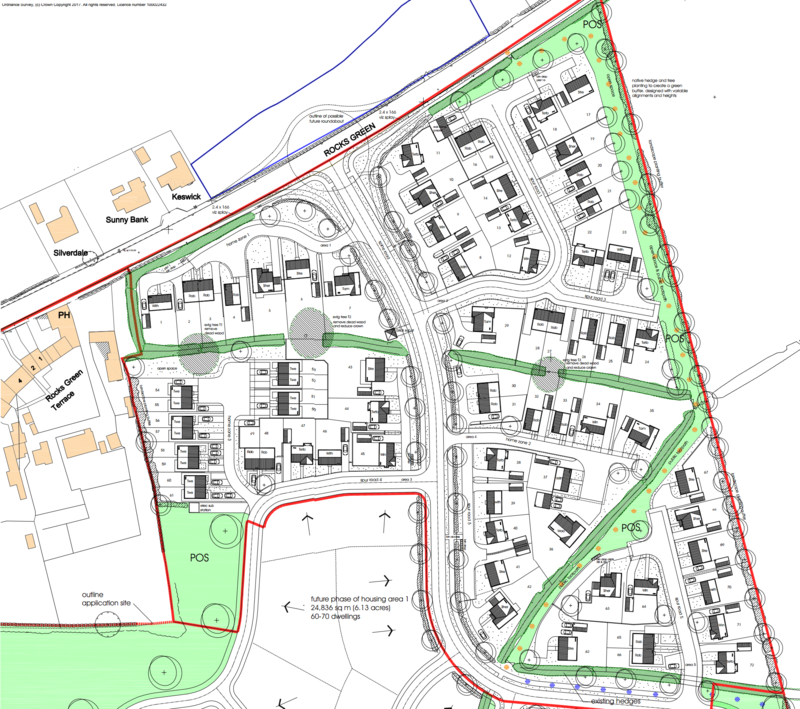 A little after 6pm yesterday, the South Planning Committee approved plans for 200 homes east and south of the Nelson at Rocks Green on the outskirts of Ludlow (17/05189/FUL). The proposal gave full planning permission to the first phase of 72 homes of which eleven (15%) will be affordable. The committee also approved an outline scheme for the second phase of housing. During debate, additional affordable housing in the first phase was agreed, along with a review of bus services to the site. Officers would not agree to the entire development being a 20mph zone but promised to review the request. By 5.40pm yesterday, the South Planning Committee was becoming a little weary after nearly four hours debating complex proposals, amending planning conditions where needed, rejecting one application despite officers’ advice to approve it, deferring a decision on another, and approving five proposals. But that didn’t limit our wish to get this application just right. The Ludlow Rocks Green development had been moved to be last on the agenda because there were no public speakers on the application. By the time we got to the application, there were just four people in the audience: two from Pickstock Homes who are promoting the Rocks Green application, Keri from the Shropshire Star, and a lone doughty campaigner, who I think was there for work experience. After the usual introduction by the planning officer responsible for the application, we would normally receive short presentations from objectors and supporters, the parish council, the local Shropshire Council member, and finally the developer. There were no presentations for this application, unusual for a development of this size. I immediately opened the debate. I said that we Ludlow unitary councillors were in favour of the development. I have long recognised that the best area to build new housing is between Rocks Green and Sheet Road along a spine road. This development is one stage in that. But there were matters to resolve. The level of affordable housing was just 12% against the guideline of 15%. It was proposed that the level was raised to at least 15%. Pickstock Homes, not formally part of the debate, nodded agreement. We decided on 15% – the maximum allowed under Shropshire Council’s planning rules. That will give an extra three affordable homes in the first phase of development. Councillor Gwilym Butler chairs the Place Overview Committee. The committee’s brief includes scrutinising planning, housing and transport. On 1 February, the 20’s Plenty campaign made a presentation to Place Overview arguing for a 20mph speed limit on residential roads across Shropshire. The minutes of that meeting are not yet published but Gwilym revealed that, although the committee had not agreed to recommend that a 20mph limit should be imposed across existing residential streets, it favoured introducing 20mph zones for all new developments. He wanted a 20mph zone throughout the Rocks Green development. The Pickstock Homes team nodded their acceptance to this from the public seats. But Shropshire Council’s transport team were blindsided with the request. We heard that the road layout is deigned to encourage 20mph traffic and that officers were reluctant to set a precedent for other developments. No committee members objected to the 20mph proposal but the best we could get from officers was the matter would be investigated. I am disappointed by this. It’s a no brainer to me but Shropshire Council’s highways policies seem to be driving in the slow lane on community concerns helping people feel safe and creating a more tranquil experience. This is a fundamental flaw in highways policy across the country. On the speed of travel, local policy it is too often subservient to national guidance and the reluctance of police forces to address road safety until the KSI rate increases. As a councillor, I take a different perspective. I want us to plan for a KSI rate, those killed and seriously injured, of zero. I want motorists to have enough time to stop when children make mistakes and dash into the road. I want people with limited mobility to cross a road where they need to without fear. I want residential areas to feel tranquil rather than like a race track. Councillor David Turner was forthright on this matter. He said that discrimination against affordable housing is not acceptable. I concurred with that. Planning policy supports mixed communities, as do most of us. I don’t think that the location of this block of housing would have raised objections if it had been luxurious detached des-res properties. I hope never again to hear an objection to affordable housing because residents don’t want such essential housing built near them.
. Where we can, the committee likes to take the applications which attract the most public interest first. This means that people don’t have to sit around for hours of often technical debate.
. If a 20mph limit is imposed after a development is approved or built, Shropshire Council must pay for the traffic orders and signs. If it is a condition of planning permission, the developer pays.
. It has already been agreed that the speed limit on the A4117 will be reduced to 30mph from shortly before this development to the A49.